The American Center for Mobility in Ypsilanti Township. Massive earth-moving equipment — life-size versions of the toy trucks that fueled generations of children’s play — noisily rumble across the foundation of the former World War II Arsenal of Democracy in Ypsilanti Township. When the behemoths leave sometime in 2019, they will have created a campus for the American Center for Mobility and its high-tech, 2.5-mile highway loop for testing connected and autonomous vehicles. 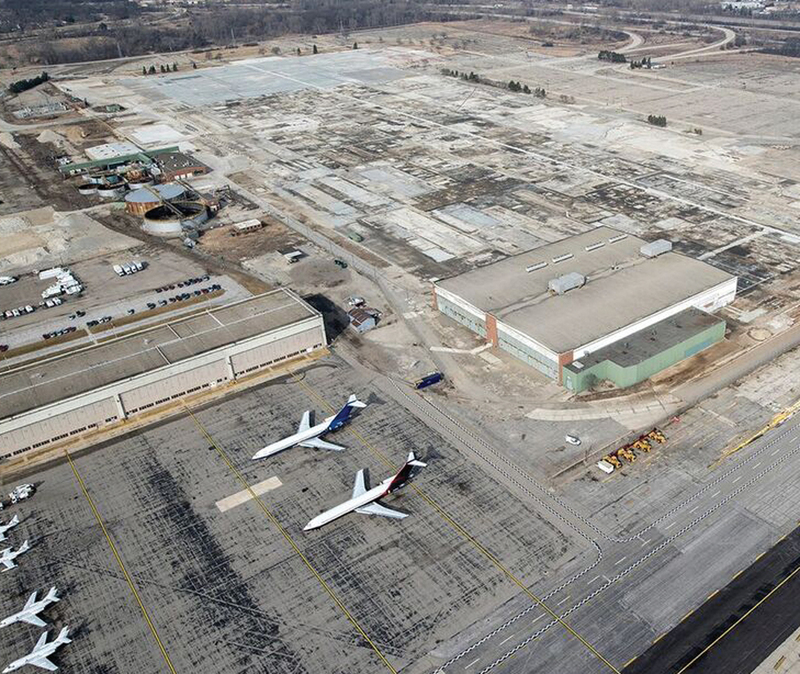 The first phase opened in December, and demand for the facilities is already brisk, says John Maddox, president and CEO of the American Center for Mobility, which is located on what was a portion of the former B-24 Liberator Bomber Plant built by Ford Motor Co. in 1942 (part of the factory is home to the Yankee Air Museum). While no one can definitely say when self-driving cars will be commonplace, the center will test them on its closed course, on public roads, and in mathematical simulations. Seeking to encourage such testing and information-sharing, in early 2017 the U.S. Department of Transportation named the American Center for Mobility one of 10 proving ground pilot sites. Of the sites in the group, it’s the only purpose-built, full-scale facility. Nothing says authenticity like incorporating an existing highway, and that wouldn’t be happening had the Arsenal of Democracy not come first. The state designed and constructed U.S. 12 in 1942 to accommodate the Ford plant, which once drew 50,000 daily workers who built more than 8,600 B-24 bombers over the course of three years. But in recent months, construction crews converted the eastbound lanes to handle two-way traffic. As it is, the center has a price tag of $130 million, most of which has been raised. Another $100 million to $180 million of existing infrastructure is being reused — U.S. 12 and the bridges are the biggest-ticket items — and tons of old concrete is being crushed and repurposed. Digging out the small stuff, especially faded stop signs and handicapped parking signs, is a helpful part of the vehicle-testing process.